Founded in 1880, Willcox became a major supply center for the military posts, the booming mining towns, and the huge cattle ranches in the surrounding area. Willcox is surrounded by beautiful mountain ranges that are just a short trip, and yet a world away, from Tucson. Many historic buildings have been preserved and are now museums and stores, including the original Southern Pacific train depot and the oldest store in Arizona to remain in its original building. The high desert country of Sulphur Springs Valley attracts thousands of rare Sandhill Cranes, which draws birders to the Wings Over Willcox event every January. October brings the annual Rex Allen Days that honor one of Willcox's native sons and last of the silver-screen cowboys. The Old West still lives here through tales of Apache Indians, train robberies, and shootings-Warren Earp was killed at Willcox's Headquarters Saloon. Perhaps the area is most known, though, for its friendliness and Western hospitality. Founded in 1880 along the Southern Pacific Railroad line, Bowie is located in northern Cochise County. It was originally named Teviston after Capt. James H. Tevis, operator of the Butterfield Overland Stage Station. Later, the town was named after nearby Fort Bowie, which was the scene of many battles with the Chiricahua Apaches. In 1886, the Apaches, including Geronimo and Cochise's son Naiche, were loaded on trains in Bowie and sent to Florida as prisoners of war. The Indian Wars in America were over. Bowie became a major shipping point for the military and the mines. A beautiful train station with a first-class hotel and dining room served the thousands of passengers traveling through. Great soil, pleasant climate, and artesian wells attracted homesteaders who grew every kind of fruit and vegetable imaginable. Ranchers in the nearby mountains shipped cattle by hundreds of carloads at a time. 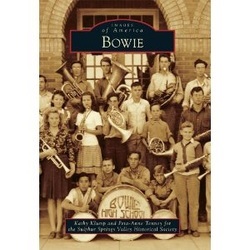 After US Highway 86 was completed, Bowie became a favorite stopping point for travelers. Pecans, pistachios, and wine from local vineyards attract visitors today. Discovery of gold in 1895 brought fortune seekers to the Sulphur Springs Valley, once the stomping ground of Cochise and Geronimo. A lawman turned train robber, an Arizona Ranger murdered by his wife, and a famous artist were just a few of the people who settled in Pearce. The Commonwealth Mine provided resources for a flourishing community until the Depression and the mine's decline. In the early 1960s, the Horizon Corporation began marketing Valley land as a utopian retirement destination for the World War II generation. Bit by bit, Sunsites sprang up just 2 miles from sparsely populated Pearce. Today the residents of Pearce and Sunsites share amenities, a quiet lifestyle, and views of the spectacular Chiricahua and Dragoon mountain ranges. Croton Springs Ranch and the Point of Mountain Stage Station. The Sulphur Springs Valley experienced an extremely interesting, dynamic and often violent early history. Every event had its reason, a cause-and-effect relationship that can be traced. In order to understand more completely the micro-history of Croton Springs and the point of Mountain Stage Station, it is important to place this history in a context that will make sense in relation to the overall history of Southeaster Arizona in general, and the Sulphur Springs Valley in particular. In modern times (1400 A.S. onwards), the valley was claimed first by the Chokonen Apaches and then by the Spaniards around 1530. The valley became a part of Mexico in 1823, when Mexico gained its independence from Spain. Our war with Mexico in 1846, and the subsequent Treaty of Guadalupe Hidalgo in 1848, resulted in Mexico ceding all of Texas, New Mexico (including all the land that became Arizona), California, and parts of Nevada, Colorado and Utah. But the Bartlett Commission, working in cooperation with its Mexican counterpart, made a huge mistake when drawing the U.S.-Mexico boundary. Bartlett agreed to allow Mexico to keep all the land south of the Gila River, which was the best land for an all-weather, transcontinental railroad. Such a railroad would connect much of the newly acquired territory with the rest of the United States. Limited edition of 200 signed and numbered copies. This essay is not intended to he a complete history of the Pearce. General Store, but it will shed much needed light or the lives of those who built and owned the store from its inception in 1896 until its first closure near the end of 1958. During that 62 year period, five people either owned or were partners in the store; they were Pablo and Mariano Solo. Thomas Chattman. Charles M. Renaud, and K. Albert Rothe. Of the five, there is no question that Albert Rolth devoted more time to the store than any of the others. He spent 48 years working there, 24 as an employee, and 24 as the owner. It is unfortunate that more information about Mr. Rolhe's life wasn't available until recently. If the public had known more, he would have taken his rightful place in the history of the store long before now. There can be no question either about the success of ihc store during the entire time the store was open. The store provided all the above owners and partners with substantial incomes, but a large part of the store's success was due to the fundamental character of its owners. All were caring risk takers, all were gregarious and generous gentlemen, and all were devoted patriarchs, through in Rothe's case, patriarch is meant to include many of his and his wife's friends and relatives in Germany. 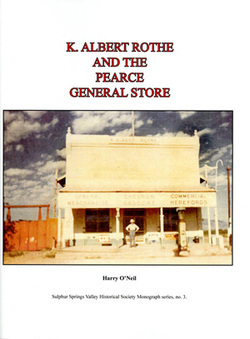 In brief, the first five owners of the Pearce General Store were just as imposing, if not more so, as the huge adobe store that began as one of the first permanent businesses in Pearce in 1901. The history of the store is being told at this time because of the recent discovery of documents and other materials that had been stored at the Sulphur Springs Valley Historical Society's Toggery research center for several years, which is an interesting story in itself. is a glimpse into the life of a small southwestern town bustling with life and events that would define its course in history. It was the beginning of a new century and new hopes and dreams. The railroad and stagelines were still the major modes of transportation. It was a year filled with fun and gaiety, train robberies and killing. The citizens included the rich and the poor, cattlemen, miners, and merchants. The town had been settled for about 20 years and was transforming from a rough, lawless town to one striving to provide new educational, religious and social opportunities. 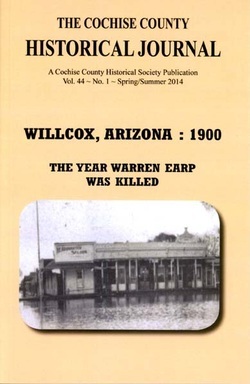 The most famous events of early Willcox were all happening in this one year along with dozens of stories of the time and the people. the story of John Walter Klump and his association with the partnership of Hurst, Black, Kiehne, and Wiley in New Mexico and Arizona. John Walter Klump aka J. W. Wiley was the grandfather of the Klump brothers who own cattle ranches in southeast Arizona. He and his partners' cattle grazed over many miles from western New Mexico into eastern Arizona, and their ranch was one of the largest ranches in both territories from 1885 to 1898. No one knew what became of the partnership and the ranch until over 700 pages of correspondence, invoices, and check stubs were recently discovered. This book reconstructs the time period of the rise and fall of a great cattle ranch and the last roundup of the cattle, which were sold to pay the debts. 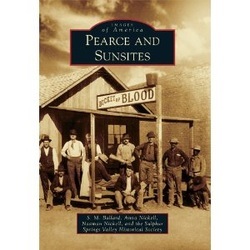 It tells of the many people involved from the partners, the receivers, the bankers, attorneys and judges, the cowboys who rounded up the cattle, and the businesses in each of the towns on the trail where supplies were purchased. Many of these people are well-known in the history of Arizona and New Mexico. 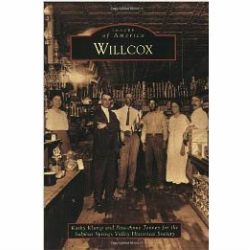 The book then follows the Klump family to Willcox, Arizona and their life there since the early 1900s. Stagecoach Pioneers and Tales from the Road. Upon arrival into California – either by steamer or by wagon train – the pioneers of the Gold Rush were thrust into a rough frontier. As the Eastern businesses opened branches in California, the entrepreneurs and miners demanded quicker mail service to replace the outmoded ocean-to-ocean service. The establishment of a land route bringing mail to California became a more frequent request that was exclaimed by many of the California newspapers. Soon it became a reality.